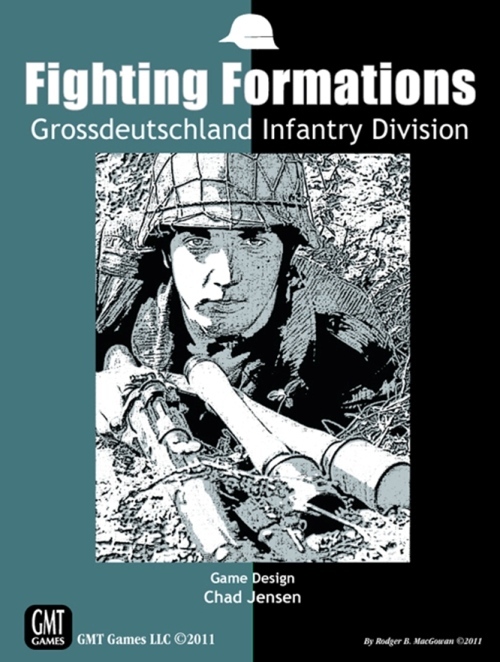 Fighting Formations Grossdeutschland Infantry Division was supposed to be the start of an ongoing series of wargames at platoon and squad level. 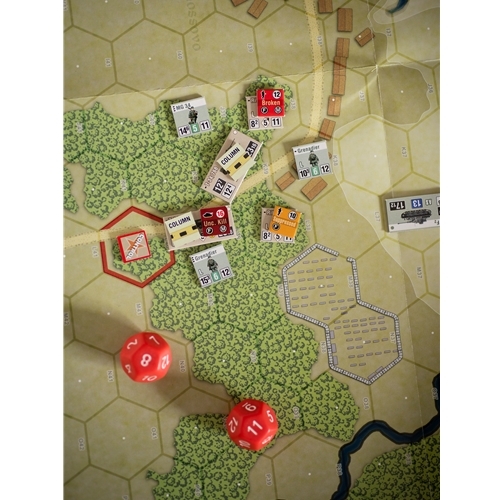 It was released in 2011 and the series was only added to in 2018 by an add-on named Fighting Formations Grossdeutschland Division's Battle for Kharkov .One of the main pulls of the series was that it was going to spotlight different combat units from both the Axis and Allies. Its design was pretty innovative and people have been waiting for other releases. The game was designed by Chad Jensen, which should speak for itself. 2 Player Aid Cards 8.5" x 11"
The scale, as mentioned, is platoon and squad. Each hex is 75 meters across. The turn time is five minutes. It's coming up on the holidays, so it seems appropriate to open up this heavy box, and see what is stuffed inside. Stuffed is the right word for this game box. I do not know if you could incapacitate a burglar by hitting him with it, but you could sure stun him. First the box itself; some people were put off by the understated cover art. I actually kind of like it. 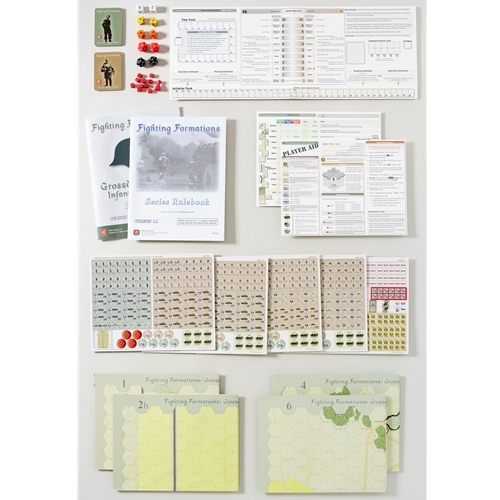 It definitely says to me that here is a wargame, and not a Euro etc. The maps are very well done, and it is easy to distinguish terrain. They also have over sized hexes at 1.5" by 1.5". The counters are a bit subdued in color, like the box. However, this also makes them easy to read. 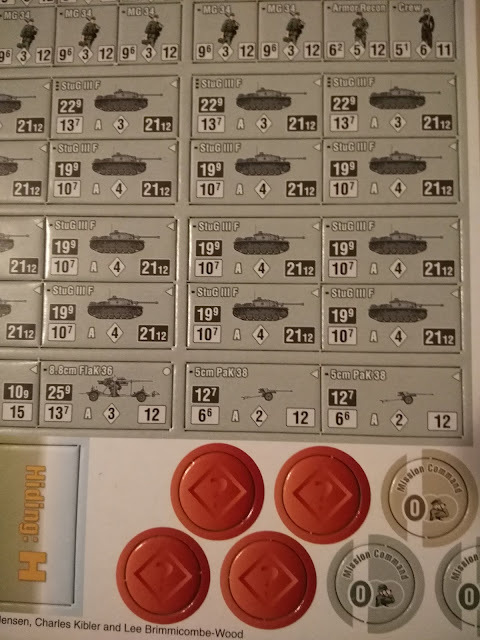 It also helps old eyes that the infantry counters are also large at 5/8" by 5/8". The tank and artillery counters are even larger at 1 1/4" by 5/8". The information markers are the usual counter size.These counters do show a side view of the weapon in question instead of top down. Some people have stated that they would have preferred to have top down views, but I think that would make them harder to distinguish from each other. 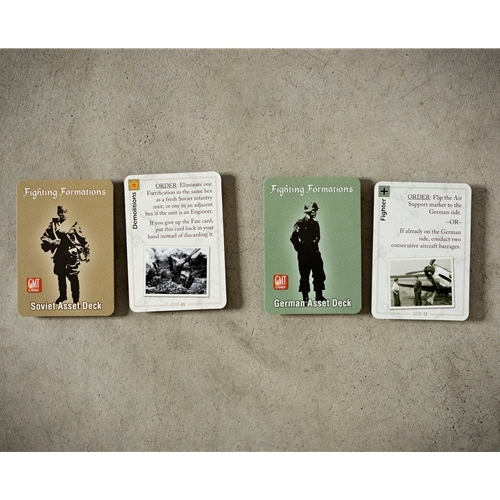 The cards are very well done, and easy to read and understand. The ten die are different colors to help you with picking the correct numbered ones. The pawn and small wood blocks are red and not fancy. You also get enough small plastic counter bags for probably two games. The game's complexity is listed as a six, while the solitaire suitability is listed as a five. Myself and others have found solitaire gaming to be higher in reality. As mentioned, the rules are very innovative. The game borrows on the designer's earlier games, but are not a copy of them, and go to a new level. This does not mean that they are obtuse or hard to understand. It helps that the rule book has eighteen full page, and in color, examples of play. The game comes with ten scenarios, and one introductory one. Two scenarios are half-map size, six are full-map size, and two are double-map size. It is good to see a tactical game not only played on small maps. I'll try to explain the game's mechanics. Rest assured that I will probably make it sound harder than it is. The game play revolves around the 'Order Matrix', seen below. The scenario information will tell you where the red 'Order Cubes' are to be placed. The red pawn shows which side has the initiative and its placement is also shown in the scenario information. You can see that the Order Matrix has numbers descending on both the German and Russian side. Likewise, the initiative track is numbered with zero being in the middle of the track, and has ascending numbers going both right and left. To start a turn, the player with the initiative gets to pick an orders cube equal or less than where the red pawn is on his initiative track. Here is where it gets a little tricky. Let us say the German player has the red pawn on on number 7 on the initiative track. He then can choose to use the red cube on the order matrix that has 'Sniper' next to it. The German player then moves the red pawn toward the Russian direction of the initiative track seven spaces (it would now be at '0'). The German player can then perform the order on number 7 the 'Sniper' order, or he may choose to do any of the orders below 7 all the way to #1. Whatever he chooses as an order, he must always move the red pawn the number of the red cube that he chooses. In explanation, the German player has taken the #7 red pawn, but only chooses to do the 'move' order that is next to the #3. He still must move the red pawn the 7 spaces toward the Russian side of the initiative track, even though he has only used the #3 order. 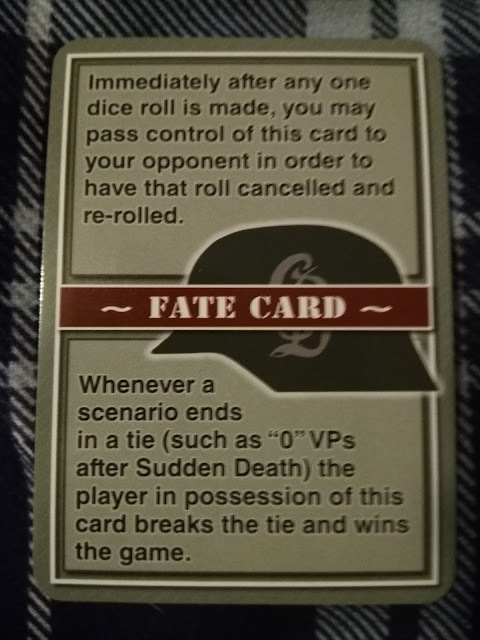 The results of these innovative rules are that a player is constantly trying to use orders, but he will also be trying to keep the red pawn on his side of the initiative track. So the player is forced to juggle between what he wants to do and what he doesn't want the other player to do. The game also give each player, depending on the scenario, Command Markers. These may be placed at any time during the turn by either player. These markers have two sides; one is named 'Mission Command', the other 'Tactical Command'. When placed the Mission Command side is used first. 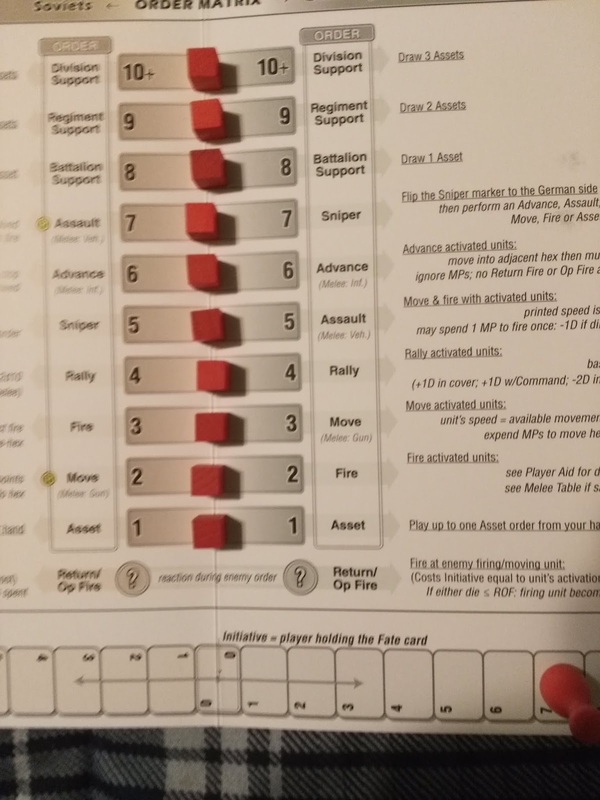 During the Regroup Phase of the turn, all of the Mission Command Markers on the board are changed to their Tactical Command side. 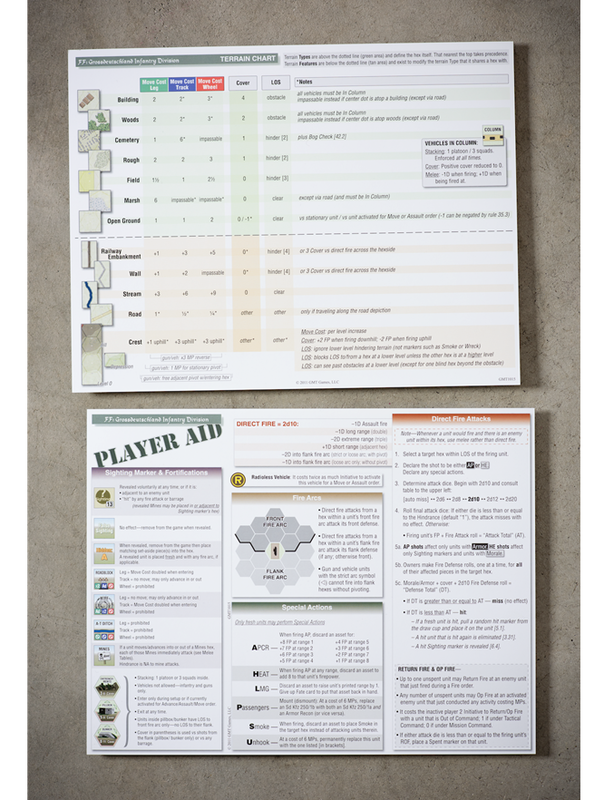 Both sides of the Command Markers drop the initiative cost to activate the players' units. The wargaming world was surprised and very happy with this very innovative game in 2011. The only thing that has led to any gripes was the lack of follow up games on other famous fighting units. The 2018 add-on for this game (soon to be reviewed), was the only new piece added to this gaming stable since it first came out. It is very surprising, seeing as the game is very good and was very well received. There is so much more I can talk about in regards to this game. It has air strikes, entrenchments, close assaults, and so much more. The play of the game flows very well for a tactical game with this much inside it. The rules are easy to follow and it plays much simpler, in gaming terms, than a tactical game like this usually does. Thank you GMT Games for the chance to review this great game.